In the late 17th-century, two society ladies in Nuremburg visited a local garden. Dressed in their Sunday best, they pounced upon a lowly worm, a caterpillar, to be exact, and happily carried it home like a treasure. This incident was later recounted with amusement by one of those nicely dressed ladies. It was a glimpse into an unusual life. 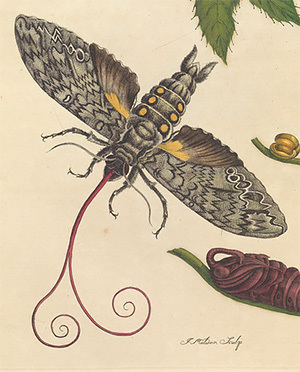 In a world of natural history generalists, Maria Sibylla Merian (also known as Maria Sybilla Merian) was a specialist, concentrating almost her entire life on how moths and butterflies metamorphosed from caterpillars. In her early 50s, she followed her passion halfway around the world and risked death from disease to study these bugs in their natural habitat. Born into a family of Frankfurt printers in 1647, Merian lived when disease and untimely death created clans rivaling today's "blended" families. Her father, Matthaus Merian the Elder, worked for the son and married the daughter of publisher Theodor de Bry, inheriting the publishing house when his brother-in-law died. Matthaus fathered sons with his first wife, and after she died, he married Johanna Sibylla Heim, who gave birth to Maria. So Maria had adult half-brothers when she was still tiny. Merian the Elder, so the story goes, foresaw that it would be the little girl who would make the family name famous. If he actually made that prediction, he was a man ahead of his time; few women in Maria's day had many chances to bring their families fame. But throughout her life, the daughter remembered her printing-house roots. 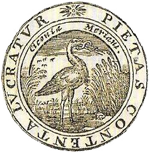 Her father's publishing logo was a stork holding an evil-symbolizing snake in its beak with the motto that piety pays; Maria Sibylla Merian later wore a stork signet ring that she used to seal the wax on her letters. When she was just three, Matthaus died, and a year later, Johanna married painter Jacob Marrel, who brought children from his previous marriage. The quick remarriages were typical for the time, as was the practice of engaging children in the family business. For middle-class businesses to thrive, everyone had to work. Marrel carried on the artistic training of his bright young stepdaughter, teaching her skills that would serve her well for the rest of her life. He and Maria's mother had two children together, but both babies died, and once Marrel's own children were grown, he left. He continued to support Johanna somewhat, but Maria and her mother were essentially on their own. Maria was only 12. Women owning businesses raised eyebrows in 17th-century Europe, though the practice wasn't unheard of. Maria had probably helped her stepfather and half-brothers with the family business and, only a teenager, she helped keep her mother afloat after Marrel's departure. A year after her stepfather left, she started studying insects. She captured them, raised them, and drew them at their various life stages. She claimed that she "withdrew from society and devoted myself to these investigations." At the age of 13, Maria had already witnessed silkworm metamorphosis, nearly a decade before anyone published a description of the process. While still in her teens, Maria married a former student of her stepfather's, Johann Andreas Graff. Graff was nearly 30. Few details are known about their union, except that it eventually soured — and produced only two children when most marriages of similar duration produced about 10. When the Graffs' first daughter was still a baby, they moved to his hometown of Nuremberg, and there, Maria began publishing. At first, she focused on pretty flowers, the first volume of her Book of Flowers coming out in 1675. But eventually bugs took over the pictures. How a caterpillar changes into a butterfly was poorly understood in the late 17th century. The remarkable changes by themselves were hard enough to grasp; parasites such as wasps and sawflies laying their eggs inside other animals so their own young would emerge confounded naturalists even further. 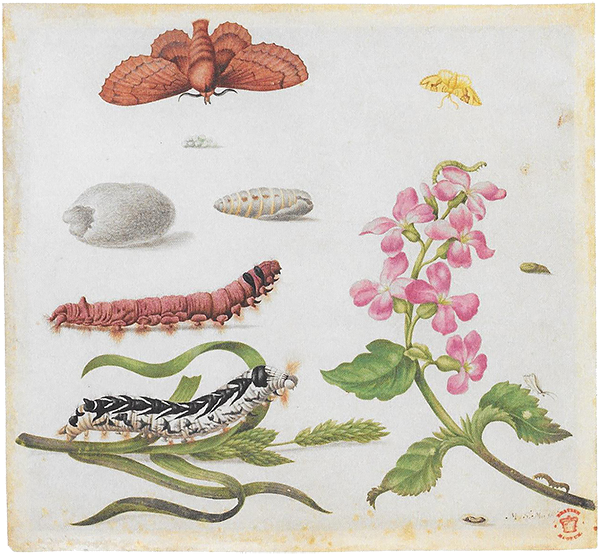 Merian often identified the interlopers and labeled the process "false metamorphosis." In 1679, she published her first book on insect life through her husband's press. She also occasionally studied another kind of animal transformation: tadpoles into frogs. After 14 years, the Graff family returned to Frankfurt. Not long afterwards, Graff traveled back to Nuremburg alone. Then Maria moved her two daughters (Johanna Helena and Dorothea Maria), her aging mother and herself to the Netherlands to join a strict religious sect: the Labadists. Founded by a Jesuit-turned-Protestant, the group aimed for a primitive version of Christianity. Graff followed his family to the religious outpost and pleaded with his wife to return, but she refused. He eventually gave up and left, but he didn't exactly leave his family in paradise. In the Labadist community, privation ruled: plain clothes, simple food (and not much of it), few fires to ward off the cold. Personal property became community property. And the community members were encouraged to keep each other from falling into sin. In other words: a big bunch of skinny, shivering hall monitors. Maria's religious fervor apparently cooled. Not long after her mother died, and shortly before the Labadist community collapsed from too few new recruits bringing much money with them, she left for Amsterdam. After years with the Labadists, Maria — who reverted to her maiden name of Merian — found herself in a city 500 times as big as the religious community she had left, and this time, she couldn't rely on her husband or her family for connections. Yet as a woman, she probably couldn't have found a better place to settle. Seventeenth-century women had to negotiate a tricky maze to avoid trouble. Witch fever was raging in Salem, and had only recently abated in her native Germany. Insects still carried a whiff of corruption, and a woman who wanted to study them was suspect. But Amsterdam hadn't burned a witch in a century. Even better, women could own businesses, keep their own property, and train as apprentices. In fact, another woman, Agnes Block, was one of Merian's benefactors, hiring her to paint exotic plants and butterflies. In this new metropolis, Merian could mingle with other women artists, even sniff around the curiosity cabinets of Frederik Ruysch. She trained Ruysch's daughter Rachel, who went on to become a still life painter. 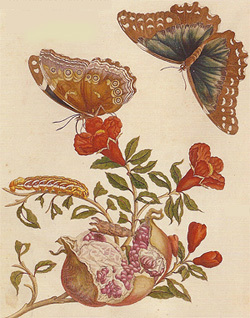 Merian and her daughters established a studio and painted birds, bugs and flowers. After several years, she was well-connected and well off. And restless. She was successful in Amsterdam, but the success came at a price. Merian was so busy earning a living that she had virtually no time to follow bugs. Her chance to resume her studies came from an unexpected corner. Though she had left the Labadist settlement at Wiewert (it had, in fact, disbanded), she stayed in touch with some of her old acquaintances, and it turned out that Labadists still operated a plantation in far-off South America, in Surinam. Merian sold more than 200 of her paintings to raise money, received a grant from the city, wrote out her will (just in case), collected her younger daughter, and boarded a ship. It was 1699, and Merian was 52. In the Surinam jungle, Merian hoped to understand metamorphosis in as many species as possible. She did find new species she had never encountered before, but the jungle brought difficulties she could not have imagined. Up to this point, she had done much of her collecting in gardens designed for human enjoyment, with flowers and the bugs that ate them conveniently placed below eye level. South American jungles didn't accommodate humans so nicely. Trees shot skyward as much as 150 feet, with different kinds of animals living in different layers, and most of the action above the canopy. In one instance, she recounted having a tall, hollow tree that couldn't be safely climbed chopped down in order to collect its leggy booty. Locals often helped her out, but when they brought her a bug, she didn't know what to feed it or how to keep it alive. Surinam was in the territory of the Dutch West India Company, and unlike the spice-rich Dutch East India Company, the western branch made its money from the slave trade. Many of the locals who helped Merian were slaves, either American Indian or African. No abolitionist, Merian had slaves of her own in Surinam, though she was often horrified at how slaves were treated. She actually had much thornier relations with the Dutch planters who, she felt, mocked her for caring about anything besides sugar. Merian marveled at their reluctance to cultivate anything else, such as grapes, pomegranates, passion fruit or native vanilla. I took this caterpillar home with me and it rapidly changed into a pale wood-colored chrysalis, like the one here lying on the twig; two weeks later, towards the end of January 1700, this most beautiful butterfly emerged, looking like polished silver overlaid with the loveliest ultramarine, green and purple, and indescribably beautiful; its beauty cannot possibly be rendered with the paintbrush. She did, however, manage to depict a long list of plants and animals, often showing them in various stages of their life cycles. Her picture of a pomegranate and morpho butterfly depicted realistic damage to leaves caused by hungry insects. Morpho wings she likened to peacock feathers, and said the insect must be seen "as it beggars description." A sphinx moth in the split-tongued stage of its life cycle. Later entomologists claimed the insect only had a single, tubed tongue, but observations have proven Merian correct. From A Pioneering Woman of Science Re-Emerges after 300 Years. Back in Holland, Merian could have profited nicely from selling her wildlife paintings to rich buyers, but she was the daughter of a printer, and a believer in sharing knowledge. 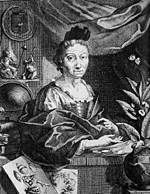 In 1705, she published Metamorphosis Insectorum Surinamensium — simultaneously in Latin and Dutch. The book brought her recognition, but not great wealth, and she had to sell specimens and paintings from time to time to keep afloat. She also worked on illustrations for work by the "blind seer of Ambon," Georgius Everhardus Rumphius. Merian lived until 1717, and the day she was buried was apparently the day that Peter the Great's personal physician arranged to have some of her papers shipped to St. Petersburg. The doctor so admired her personal study book, which she had maintained since girlhood, that he kept it for himself. Merian's likeness appeared on the Deutsche Mark 500 before Germany converted to the Euro. Merian's daughters were both accomplished artists. A year after Merian's death, her younger daughter moved with her own family to St. Petersburg, where she was commissioned to paint specimens from the czar's curiosity cabinet and give museum tours. She became the first woman employed by the Russian Academy of Sciences, though she probably struggled financially as her mother had. Merian's work certainly did contain some errors, but no one's work was error free. Accuracy was an extra tough standard in her day, when art couldn't just show plants and animals, it also had to communicate the right symbolic meaning. Each plant carried its own message, and the larger composition had its own larger message, too. Merian's stepfather Marrel greatly admired the emotionally tortured Caravaggio, and just as Caravaggio suggested life's fleeting nature with crumpled foliage and bruised produce, Merian showed the passage of time in her own work. A bud, a flower in full bloom, and a dead flower chewed upon by bugs could all inhabit the same twig in one of her pictures. It showed with a life cycle, and communicated a message. Metamorphosis Insectorum Surinamensium was often judged harshly during the 19th century. Merian was occasionally criticized for depicting insects on plants they didn't inhabit, but she explained that she didn't want to show the same plant again and again. One picture that drew particular scorn showed the murder of a hummingbird by a wretched tarantula. Reverend Lansdown Guilding, who, in the words of one historian, "never set foot in Surinam," called the plate "entomological caricature." What upset him, besides the bird-killing spider, was the depiction of ants building bridges with their bodies — a process that surprises no one today. Another critic, William MacLeay, accused Merian of "willful falsehood" after offering birds to similarly large spiders who fled the vertebrates in terror. About the same time, however, W.E. Shuckard presented evidence that big, hairy, disgusting spiders could indeed kill pretty little birds — a noble defense of Merian, even if a sad fact of life. Merian's life and legacy were rife with contradictions. She enjoyed successes few women of her age did, but her gender still limited what she could do. Members of academic and scientific societies of the 17th and 18th centuries bought and discussed her books but didn't invite her to join their all-male clubs. Born into a family of printers provided her excellent training and contacts, and she was literate in German. But she never learned Latin and never pursued a higher education. She had no formal credentials, but helped invent the field of entomology, and her work was often critiqued by people who knew far less than she did. After Merian died, new versions of her book saw publication, none of them improvements. In fact, later books were so adulterated with misinformation (not uncommon on those days) that her reputation suffered. It rebounded somewhat when the Soviet Union released some of her original artwork in the 1970s. Today she is remembered as someone with singular focus on metamorphosis and, in a larger sense, the importance of studying the animal's habitat along with its anatomy. On April 2, 2013, Google celebrated Merian's 366th birthday with a Google Doodle, featuring a plant inhabited by multiple insect species next to a cheerful-looking lizard.